1 - Introduction and Literature Review on Ps AF treatment - Prof. Deisenhofer Débute à : 0min.31s. 2 - The crucial role of a durable PVI for increasing success rate from the first procedure - Dr Gupta Débute à : 5min.53s. 3 - Is “PVI-only” always the Best Ablation Strategy for Persistent Atrial Fibrillation? - Dr Jadidi Débute à : 24min.48s. 4 - Q&A session. Take home messages and Conclusion Débute à : 42min.0s. This programme is accredited by the European Board for Accreditation in Cardiology (EBAC) for 1 hour of external CME credit. Each participant should claim only those hours of credit that have actually been spent in the educational activity. The EP field is undergoing an important transformation with regard to standardize the Afib procedure, in a safe, effective and efficient way. The purpose of this webinar is to support participants interested in advancing their RF AF ablation practice and in knowing how they can increase success rate from the first procedure in Persistent Afib patients. 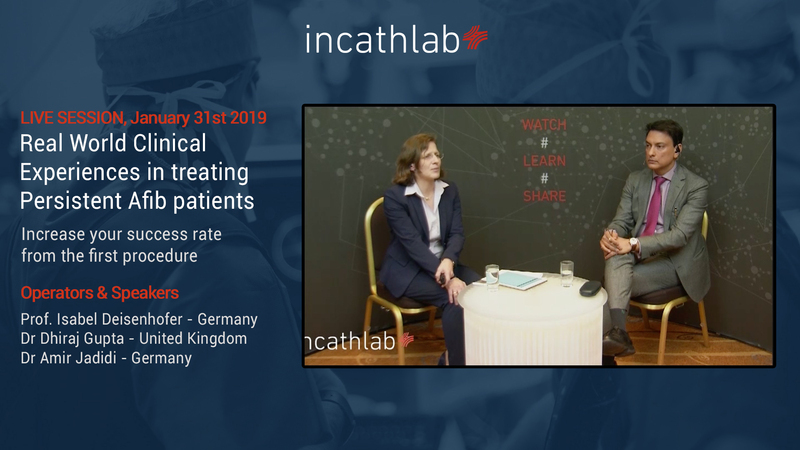 The faculty will discuss their successful experiences, presenting their data and sharing tip&tricks to show their optimized workflow to treat Ps Afib patients with the latest technologies available. Is “PVI-only” always the Best Ablation Strategy for Persistent Atrial Fibrillation? In compliance with EBAC guidelines, all speakers/chairpersons participating in this programme have disclosed or indicated potencial conflicts of interest which might cause a bias in the presentations. The Organizing Committee/Course Director is responsible for ensuring that all potencial conflicts of interest relevant to the event are declared to the audience prior to the CME activities.